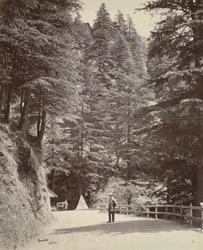 Photograph of the Mall in Simla, Himachal Pradesh, taken by Samuel Bourne in 1865. The hill-station of Simla was a popular resort with British residents of India from the 1820s. Simla became the summer capital of British India when the Governor-General began to take his council with him to the hills to escape the intense heat of Calcutta. It is now the capital of the state of Himachal Pradesh. This is a view of the Mall in the snow, the main thoroughfare in Simla, a popular place for walks, drives and meetings on summer evenings when the British 'took the air'. The central area of the Mall contained shops, a bank and the General Post Office. This view is taken near 'Glenarm', one of the private houses for rent near the Mall.